2. Who wrote the political treatise Myśli nowoczesnego Polaka (Thoughts of a modern Pole)? 3. Which country won the Russo-Japanese War? 4. What events forced the Tsarist regime to make concessions? 5. Which Russian Tsar allowed the establishment of a parliament, the Duma? 6. 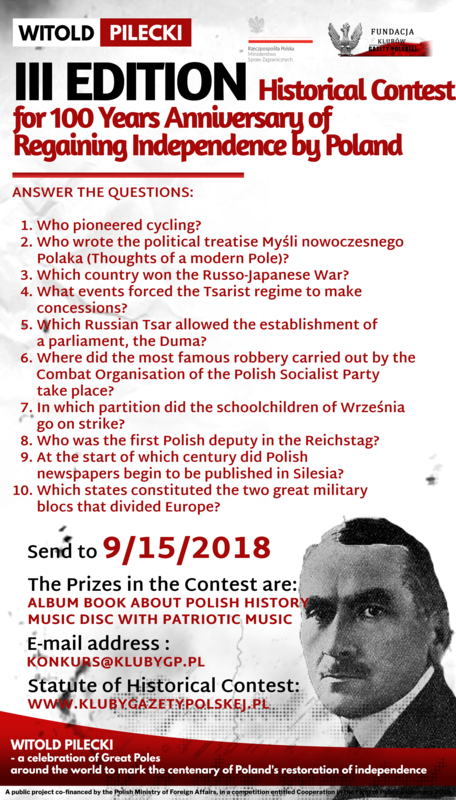 Where did the most famous robbery carried out by the Combat Organisation of the Polish Socialist Party take place? 7. In which partition did the schoolchildren of Września go on strike? 8. Who was the first Polish deputy in the Reichstag? 9. At the start of which century did Polish newspapers begin to be published in Silesia? 10. Which states constituted the two great military blocs that divided Europe?